This 2-Day Get-Away in Versailles aims to give you the best of Versailles, and to offer a nice reprieve from the hustle & bustle of Paris. Spend one night in a luxury hotel, and see the chateau in detail and at a leisurely pace – the palace of the Sun-King, Marie-Antoinette’s estate, the gardens and the water canal and so on. Enjoy the country town of Versailles as well – a hidden gem, full of treasures, and a wonderful French town. Rejoin Versailles in a private car from your location in central Paris. Stay in a cozy 4-star hotel very close to the Palace entrance. •	Get Away : explore the city and the Chateau all on your own, at your own pace, with a 2 day pass that is included in your package – in addition to all of the above. 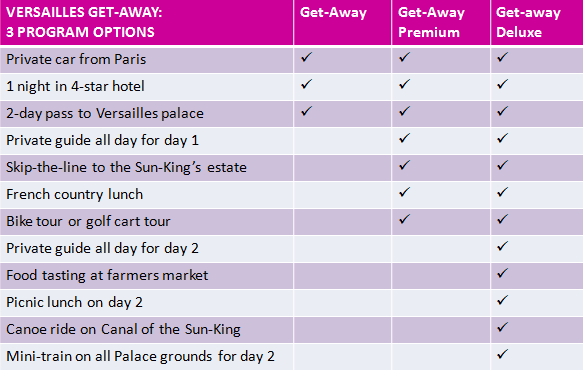 and Get Away Deluxe and pick the you prefer ! Get the best of Versailles : the charming village, the countryside, and the famous Palace..
Stay in a peaceful 4-star hotel, charming and comfortable, with breakfast included, a few steps away from the Palace. Use your 2 day unlimited pass to the Castle with no rush. In the morning of your first day, ride a private car from your hotel or any other central Paris location you request, such as train station etc. (airport pick-up can also be arranged, for a small extra fee). Advanced reservation is of course needed, and can be made up to 5 days in advance. Our Versailles Get-Away is available all year. Versailles palace is closed on Mondays, and on Jan.1, Dec. 23, 24, 25 and 31st. Available in English and of course French. To give the palace of the Sun-King the attention it deserves. To treat yourself to a bit of luxury. And to experience the real France, outside of Paris. •	Transport in a private car from central Paris to your Hotel in Versailles. •	A night in 4-star hotel le Versailles, with full breakfast. •	2 days-pass to Versailles Palace, with audio guide in 11 languages. Cancellation policy: your payment is 100% refundable up to 72 hours prior to the tour. No refunds less than 72 hours prior. Secure your booking and your guide with a $100 deposit on the book now button below. Our team will get in touch with you to take care of the details. Visiting Versailles requires a significant amount of walking. Wheelchairs not advised. Booking confirmation will be sent at the time of booking. To stay more than one night, book first, and then contact us. Kids under 3 stay for free at the hotel. Family rooms of up to 4 people are available for families with kids 17 and under. If a date is not listed as available, contact us for possible arrangements. At your convenience on the morning of day 1. Tour does not include: food and entrances unless specified. You can book your guide now by making a US$100 deposit.